OTTAWA, March 7, 2017 – The Macdonald-Laurier Institute is pleased to showcase the second paper of its Confederation Series, authored by MLI Munk Senior Fellow Alastair Gillespie. This paper offers an important look at George-Étienne Cartier’s role in the birth of Confederation. 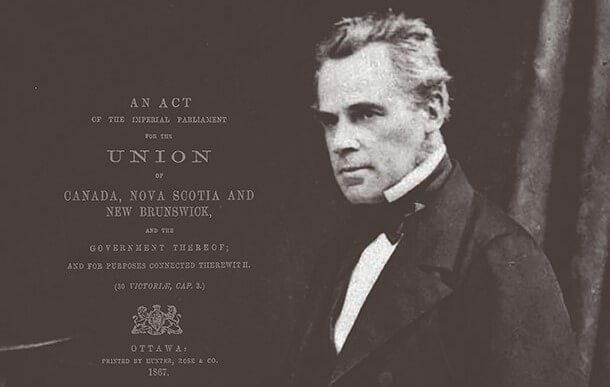 With an introduction by Jean Charest and Antoine Dionne-Charest, the paper explores Cartier’s role in advocating a federal solution to the challenges facing the union between Upper and Lower Canada. To read the full paper, titled “George-Étienne Cartier: The Canadian,” click here. After forming the Cartier-Macdonald government in 1858, Cartier took the unusual step of supporting federation for all British North America, even if this ran counter to his past opposition to representation by population and would mean an end to the powerful influence of French-Canadians in the union of Upper and Lower Canada. This bold change in policy risked his own political leadership in Lower Canada, but was a crucial building block of Confederation. By helping to form the Great Coalition of 1864, Cartier set aside his long-standing feud with George Brown, conceding rep by pop in exchange for a new provincial government for Quebec, and equal representation of Quebec and Ontario in the federal Upper House. Most importantly, Cartier articulated a new vision of a national community encompassing all of British North America – based on a new political nationality capable of bridging “the ethnic, religious and linguistic divides” between English and French-Canadians. This vision of Canada acknowledged the value of diversity and the need to protect minority rights, in a manner that is familiar to Canadians today. The Cartier paper will be followed (in order) by papers on Alexander Galt, Thomas D’Arcy McGee, and Sir John A. Macdonald. To support the Confederation Series, MLI established The Confederation Project, an online resource to publish and collect the speeches featured in the papers. George-Étienne Cartier’s Speech in the 1865 Confederation Debates can be downloaded here. Other speeches are also available on the Project webpage, with additional ones to be released over the next few weeks.